I get muddy water many times in the year like during the rainy season and summer season also whenever there is leakage somewhere in the pipeline which supplies water at my home. I tried to filter such muddy water with traditional methods like filtering the water with fine cloth and using alum. But both of these methods doesn’t work quite well and doesn’t look like a permanent solution. So I did some research on the Internet and found that, the UF water purifier is the one I need for the purification of such muddy water and the water having visible impurities. 1 What is UF water purifier? 2 Why UF water purifier is required? 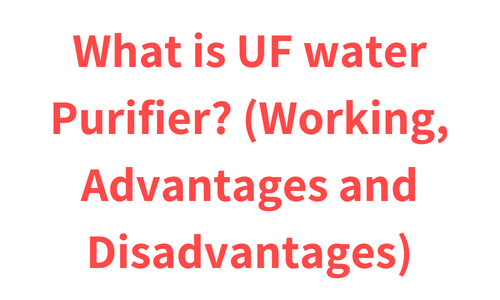 3 How does UF water purifier work? Why UF water purifier is required? UF water purifiers are the most economical water purifiers. They can easily remove dust particles, sand, clay, chlorine, bacteria and other microorganisms. So if you are getting water from Municipal water supply then it is already purified but it may contain dust particles and bacteria. Also municipal water is usually treated by chlorine which forms harmful chlorine by-products in the water and such water is not considered as good for health. So to remove such harmful contaminants from the water UF water purifier is required. How does UF water purifier work? Usually UF water purifier contains two compartments the upper compartment and the lower compartment. 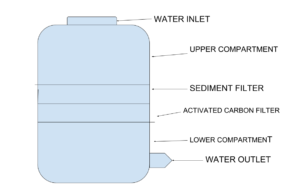 We have to fill the water in the upper compartment and the purified water gets collected in the lower compartment. In-between the upper compartment and the lower compartment, there are various types of filters. UF water purifiers uses simple water purification techniques to purify water. It does not uses any kind of electricity to process all its purification operations, which makes UF water purifiers most economical among all the water purifiers. It uses Gravity, activated carbon filter and sediment filter to purifier water. Now let’s have a look at the working and benefits of such water filters. Sediment filter works as a net which removes the dust particles and other visible impurities from the water. The activated carbon filter is made from coal, wood or coconut shell. It is activated by adding positive charged ion which allows it to absorb contaminants. It absorbs harmful chlorine by-products and other volatile organic compound (VOCs) from the water. It also removes unpleasant taste and odor from the water. Now let’s move towards advantages and disadvantages of UF water purifier. UF water purifiers are the most economical among all the water purifiers. UF water purifiers are very portable. UF water purifier does not need any kind of installation. It removes dust particles, sand, sediments, chlorine and some other visible impurities from the water. UF water purifier are cheap comparing to others. UF water purifier have very low maintenance cost. UF water purifier does not remove dissolved solids. UF water purifiers does not remove viruses from the water. UF water purification technology is a very simple, basic kind of purification Technology. If you are using water from Municipal water supply then the water is already purified by treating it with chlorine, so most of the contaminants like bacteria, viruses and other contaminants are already removed. But sometimes some contaminants like dirt and mud remain in the water or they get introduced while supplying the water, so such contaminants can be easily removed by a UF water purifier. If you get water from well or any source other than Municipal water supply then it may be a high TDS (total dissolved solids) water. TDS up to 500 mg/l is acceptable according to Bureau of Indian Standards (BIS) but if it does exceeds 500 mg / l then it is not considered good for health (although acceptability may vary according to circumstances). Basically it is a high TDS water so in such condition you should go for a RO water purifier as UF water purifier does not have the capability to remove dissolved solids from the water. Also UF water purifier does not have ability to remove Bacteria and Viruses from the water. Such contaminants can be easily removed by using UV water purification. Know the difference between RO, UV and UF water purifiers here.